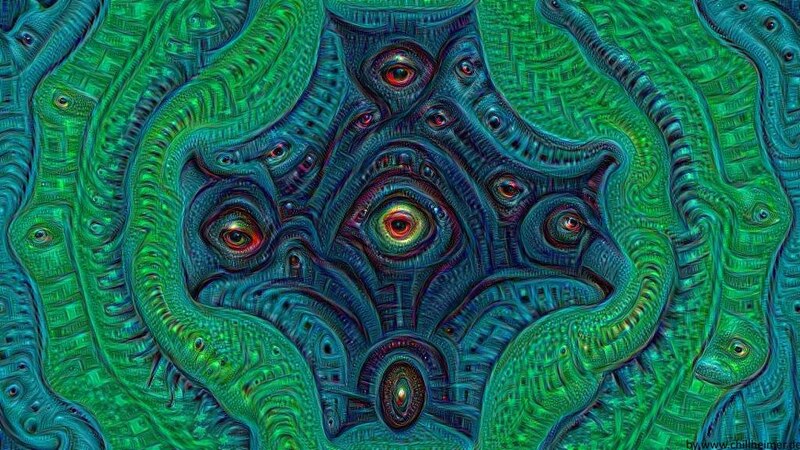 Amidst the viral wave of deepdream pictures hitting the web, there has been a conspicuous absence of analysis or commentary about the artistic or philosophical significance of this phenomenon. It is clear that deepdream is more than just a filter. The network’s algorithms detect certain aspects of each picture and process each segment accordingly. The same set of algorithms can fill an image with dogs, and in another accentuate the pagoda-like elements. It can even present these stark contrasts in adjacent parts of the same image. In other words, beyond more alteration, it can read and interpret each image. It is due to the negligence of the artistic community that the “surrealist” label has been widely applied to describe the images and the process of creation they seem to entail. Surrealism it is not, for while surrealist art is full of such partial objects scattered around abstract landscapes, it still relies on a symbolic support to be fully constituted. This symbolic support is inserted not as form, but as content, which is why every surrealist piece appears to have an excess of content. This excess stands for the excesses within human nature, society, etc even within accepted frames. Dali most famously used surrealism to represent the excess at the heart of enjoyment, especially sexual enjoyment. 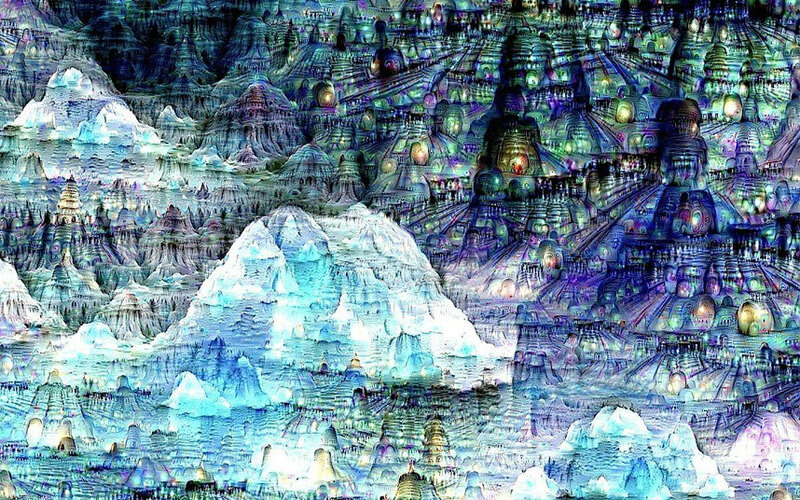 There is no symbolic support to deepdream images; rather than a continuum of meaning, what is salient is the disconnect between the original image and the processed images with their emerging features. And if this excess of content does not stand for excesses in its symbolic support, then what does it stand for? If I could go on at greater length about art or art history I would venture a comparison with Delacroix or Picasso, but unfortunately my touchstone for appreciating the significance of this new cyborg medium is much less learned. 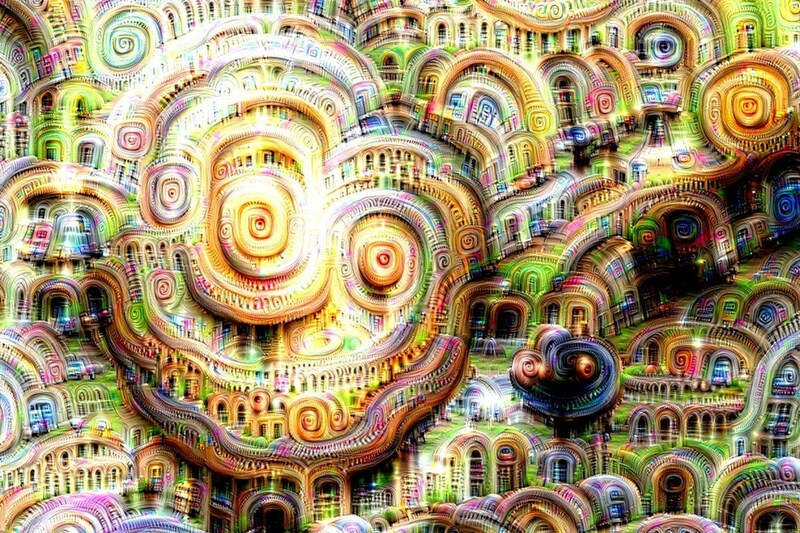 As it has been quite often remarked online, these images are not just “trippy as hell”; they actually evoke images and experiences people have had while on psychedelics. Looking back at my own experiences, I would not dispute this. I tend to think that the meaning of those experiences is overstated, and that the suspended and overlapping state of perception accessible to one on psychedelics is also accessible through other means, such as meditation, certain kinds of mental illness and certain stages of sleep. Yet I see such experiences as revealing certain dimensions which underlie perception and the subject, though not necessarily in any spiritual sense (though it seems this door is also open to many). These imaginary dimensions are suppressed by and haunt our normal range of perception, but also enable it. It is clear from this explanation that the process is not meant to be entirely independent of human intervention. Supervision surrounds the process at the input and output stage, effecting a kind of trial-and-error which gradually perfect the algorithm. Yet even the errors in the process serve very similar functions to the correct representations, by allowing the network to perceive its own altering mechanisms at work and thus isolate the features of the input layer which it is meant to recognise. This internal representation, coupled with sophisticated interpretation and integration of external images, slowly produces an AI that can understand the outside world pretty well. Yet currently it is a process still mediated by human supervision. It does not seem too radical an assumption that good image recognition is essential to the emergence of any integrated AI. At the very least, it develops the AI’s ability to interact with its inputs as slices of an external world it is independent of. In any case, it should come as no surprise if AI develops most rapidly as a Google-mediated hive mind, rather than as a stone-cold rationalist armchair overlord robot. After all, this was precisely the evolution envisioned in the film Ex Machina. Whether or not AI develops to the level of sophistication and independence that Ex Machina envisions, the deepdream phenomenon seems like more than a temporary pit stop. Even though these images might in future be considered as aberrations in light of more efficient image recognition, their necessity to this development forces us to consider their subjective impact. Thus far, they have appeared as eerie excesses that have produce uncanny parallels with human aesthetic experience. To me, they resonate particularly strongly with a moment of subjective experience which Žižek calls the “Night of the World”, after his interpretation of Hegel’s enigmatic passage. And here I borrow from Robert Sinnenbrink’s most lucid summation. ‘an exemplary description of the negative, disruptive, decomposing power of imagination, “as the power that disperses continuous reality into a confused multitude of ‘partial objects’, spectral apparitions of what in reality is effective only as a part of a larger organism”’. 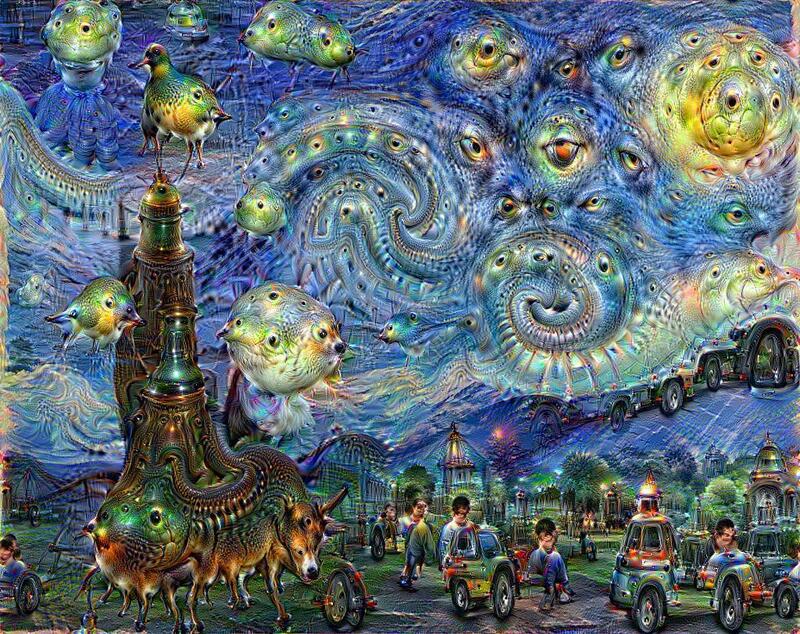 Does this not precisely describe the uncanny dimensions of deepdream? One should note the precise meaning of abstraction here in the loose homology between “a body without organs” and “organs without a body”. This reversal is possible because we can make a categorical distinction between organs and bodies. However, it is not clear from looking at an image what the status of these components are, and which is more fundamental- that is, whether a body is more or less than the sum of its organs, and vice versa. What allows one to think the two separately is the violent power of the imagination to abstract organs as individual parts of bodies. 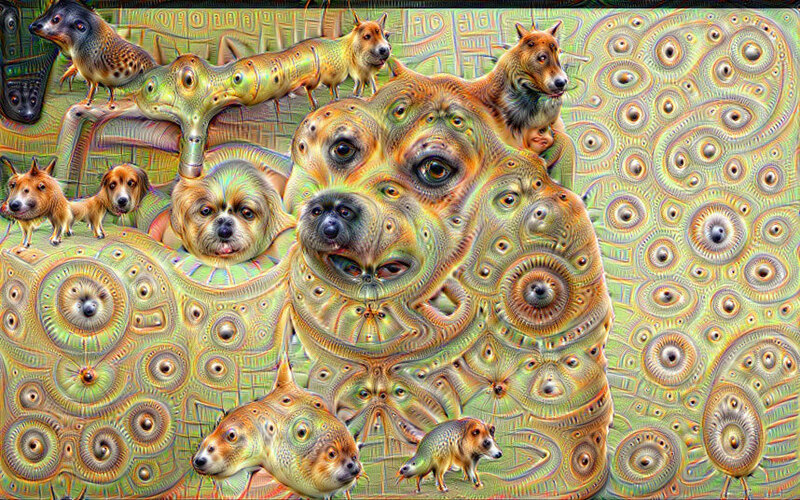 This power appears in the deepdream images in the border regions between a dog, or car, and the shapes around it, in which a shape dissolves into a swirl. These represent a shift between the partial object and its posited background, and the gradient of this shift pushes the network towards ever more abstracted alteration and recognition, which is why we don’t see adjacent images of dogs melding into it, but rather more and more dogs appearing from particular features of “prior” dogs. This holds true in most of the deepdream images I’ve come across. The main exception I’ve come across is where artists such as Bernard Geiger have fed fractal images through the network, in which case the emerging partial objects cut broadly across the image at the expense of particular details, while still maintaining a level of symmetry across the overall frame. Yet this should not surprise us, for fractals represent the ultimate active background, displaying a richness of detail and texture which are nonetheless mere instances of an overall mathematical frame bearing no contingency and signifying nothing but iterative formulae. Thus here it represents yet another example of the power of deepdream to disrupt a harmonious fabric through abstracting from it objects with no clear form or symbolic coordinates. 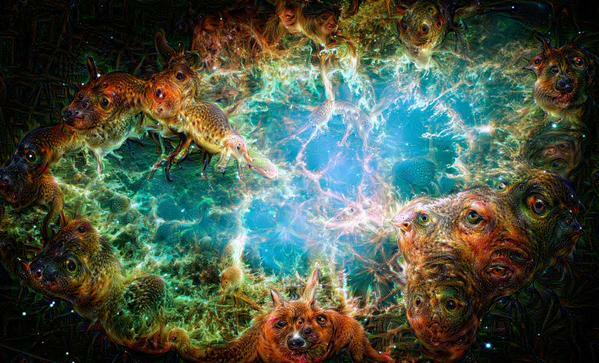 an instance of Bernard Geiger’s fractal deepdreams. ‘(the power of this night is) the gesture which opens up the space for the Light of Logos’. And by the Light of Logos Hegel of course refers to the seismic force of reason and the Enlightenment. You don’t have to buy this kool-aid from one of the least-well understood figures in Continental philosophy, but it does provide a compelling account of the significance of such instances of aesthetic development, even if it is not clear precisely what the subject of that development is or what it will look like. In light of this parallel, one can imagine to see deepdream as an augur of a not-too-distant AI whose trajectory is both reassuringly and uncomfortably close to the structure of the human subject. But seriously- what’s with all the dogs?